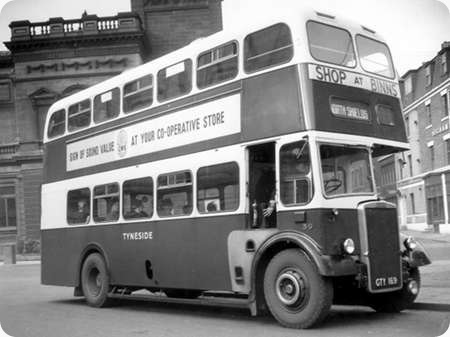 Tyneside Omnibus Company were a subsidiary of Northern General, they may of run a more local service than the very large area that Northern General did. If you know, let me know, please leave a comment. Typical of most rear engined buses of this era it had the “bustle” look at the rear, it was a year or two later before the enclosed look at the rear appeared on the scene. I remember these buses when I was a kid in the 60’s early 70’s. Tyneside ran the service from North Shields to Newcastle via Wallsend. Their depot was based in Wallsend and they never used service numbers – only the destination. People on North Tyneside simply called it "the green bus" service. They later adopted the service number 13 and ran it jointly from Wallsend with the Tyne Wear PTE. It later became service 313. We used to get the 313 across from the Railway pub (now the Bogey Chain) outside Bridon ropeworks (Haggies) back in the early/mid 70’s. The Tyneside bus service travelled from North Shields to Newcastle via Howden and Willington Quay, through Wallsend, Walker, Byker, it’s terminus in Newcastle was beside the BBC Broadcasting House premises. I recall seeing Tyneside Leyland bodied PD 2/12s waiting at the North Shields terminus at the top of Borough Bank. They always looked purposeful and turned out immaculately. The Tyneside Omnibus Company had originated as a tram operator and in the 70s and 80s the drivers were still members of the tram driver’s union and not the TGWU. They operated only one or two routes between North Shields and Newcastle, where the terminus was in Croft Street, in front of the BBC offices. I don’t know if Croft Street still exists; if not it was almost diagonally opposite to the Laing Art Gallery. It was a small but very profitable depot, and the buses were generally very well maintained, which was not always the case with its Northern General Transport stable-mate, Tynemouth and District Transport. There was a friendly rivalry between the Tyneside and Tynemouth drivers who shared a canteen just off Wallsend High Street. The bus stop was by "Boydell’s" toy & Model Shop. 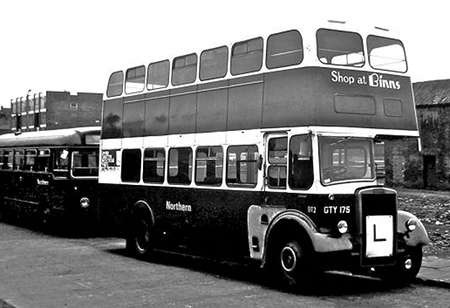 I spent many a journey from North Shields to Newcastle on this Companies Buses. If memory serves me well there was a "German Barbers" by the terminus on Borough Road. I also used them when I used to work at Willington Quay. Ah – that would be Herr Cutt! Tyneside Buses always had brown leather seats unlike the Moquette used on Tynemouth Buses. There was a conductress who worked for years on the route who always wore a man’s uniform cap. Before moving to Hadrian Road the depot was on Neptune Bank in Wallsend.Repaints were usually carried out at Tynemouth’s Cullercoats Paint Depot in John Street. I also remember that the Fleet-names were not of the usual gold and underlined style. Instead TYNESIDE was in white block capitals which together with there being no route number display gave quite an independent company look to the fleet. I believe that the company were known as Tyneside Tramways and Tramroads and one of their services was to run trams from Wallsend to Gosforth Park Racecourse. They may have run from Tynemouth but this was all before my time. The route ran what was then cross country, I think through Biggse’s Main, somewhere near Tyneview Park, through West Moor and into the east side of Gosforth Park. I understand that this route was taken to avoid crossing the then Newcastle City boundary where there was possibly a monopoly operated by the city council. Parts of the tramway can still be found today. When I was young, in the 1940’s, they only had one route, that from Croft Street, Newcastle to Borough Road, North Shields, every ten minutes. This was run by buses but the original tramroads name was still printed on their tickets. The service was well known for its exceptional punctuality. It was always said that you could set your watch by the green bus service. The photograph above shows the bus waiting at Croft Street, Newcastle, outside the BBC studio (old maternity hospital). This building still exists although it is just out of this picture, to the right. Used the ‘Green Bus’ regular from North Shields to Howden where my Auntie lived. No numbers, just the destination. Terminus at North Shields on Borough Road did have a barbers next to it and yes he was a German. We referred to it as ‘Herr Cut’ Also spent many hours at Tynemouth’s Percy Main Depot as my grandmother worked in the canteen there. Used to go out with the crews and went all over the area for free. Great days. Northern’s Percy Main depot ‘Tynemouth and Wakefields’ had several routes that criss crossed Tyneside’s route, this didn’t cause any problems because our buses were in Northern’s maroon livery and displayed route numbers, and everyone only ever called Tyneside ‘The Green Bus’ however, during the summer months we often needed extra vehicles to run duplicates on the coastal routes. If they were Northern red or Sunderland District blue they could be used anywhere, but if ‘as often happened’ they were Tyneside buses, they had to be kept well away from Wallsend or Howdon ‘Howden is in Yorkshire’ otherwise all hell would break loose when regular ‘Green Bus’ passengers discovered they’d boarded the wrong bus. P.S. to my previous comments about Tyneside’s buses. Most of the Northern group used ‘Setright’ ticket machines, but Tyneside had the multi coloured pre printed type used by Newcastle Transport. I don’t know the reason but it may go back to the trams, as I believe that from Wallsend boundary to Newcastle City Centre, Tyneside’s trams ran on Newcastle Corporations tracks. Does anyone know? Further to Ronnie’s last query, Tyneside trams did run on Corporation tracks between Wallsend Boundary and Stanhope Street in Newcastle; Stanhope Street was just off Westgate Road and not far from Wingrove tram (and later trolleybus) depot. Tyneside motormen received additional pay when operating over Corporation metals but their cars carried Corporation conductors on this section and all revenue (except for a mileage allowance of 2d per mile operated!) went to the Corporation. When first constructed the track at Wallsend Boundary was continuous but the overhead wasn’t and this had to be connected when through running was eventually agreed. With regard to Brian’s comments, Tyneside cars didn’t run to Tynemouth (and on to Whitley Bay with dreams of extending further) but through running was impossible as Tynemouth’s trams ran on a 3’6" gauge whereas Tyneside used standard gauge. There was, however, a very short section of interlaced track close to the North Shields termini which, I believe, was the only such example in the British Isles. The Gosforth Park route ran via Bigges Main, across Benton Road, in between what is now the Ministry (DWP) at Longbenton and what is now the Freeman Hospital), South Gosforth and the Great North Road although Tyneside did have running powers over Corporation metals on the route Brian mentions but these powers were only exercised for a short time and were used only by excursion cars in one direction only. I don’t think Tyneside buses ever operated to Gosforth Park: in my lifetime, certainly, their Gosforth route, which operated only at times convenient for shifts in the shipyards, terminated in Rothwell Road which is behind Gosforth High Street and on the former route of the tramway. Sometime after the opening of the (first) Tyne Tunnel a peak hours only service was introduced between Wallsend and Jarrow. As Ronnie says most of the Northern Group companies used Setright Speed machines after 1956 when they replaced Bellgraphics (as we always knew them!) but Tyneside and Gateshead and District continued with Ultimates; Gateshead’s, however, were the more common 5 barrel type (as were the Corporation’s) but Tyneside’s were 6 barrel models. I’m not sure, but I would have thought that the most likely reason that those subsidiaries used Ultimates was the speed of ticket issue: Ultimates were much quicker to use (once the combinations for higher value fares had been memorised) and most of Gateshead’s routes were, like Tyneside’s Riverside route, very busy. The reason for Tyneside using 6 barrel machines may have been simply in order to reduce the necessity to issue combinations or double-issue tickets on a particularly busy service. As an aside (and I apologise for digressing), technically another Northern subsidiary also used Ultimates. The C&E Bus Company (named after Messrs Colpitts and Ellwood) were taken over by the Venture company in 1951 (almost 20 years before Venture sold out to Northern) although the name was retained; after the takeover and for the remainder of their separate existence, Venture operated the former C&E services "on hire to the C&E Bus Company" and Northern also retained the name as a non-operating company after the acquisition of Venture. At one time C&E used Ultimates and I well remember that their surplus rolls were offered for sale at the Venture office in Marborough Crescent Bus Station during the early 1950s. So pleased I’ve seen this, beginning to think I’d imagined the green bus. My mother used to get this if she’d missed the Tynemouth or Whitley Bay bus from the Haymarket. We had to run down Northumberland St, and hurry past people, to try and catch it. I liked to look out for ‘Simpson’s Hotel’ the men’s hostel on Buddle St, Wallsend. There were always men leaning against the wall outside and I tried to see inside the bedrooms from the top deck of the bus. My mam used to tell me not to stare and I felt sorry for the men not having a home. I can vaguely remember walking from Borough Road, it seemed a long way as we had to catch the bus to Marden from Saville St, opposite the old library. There was a toy shop there and I would look in the window until the bus came. I’d be curious to know who posted the "Herr Kutt" comment, as this was always a mildly derogatory term used by a very good old friend, who has as yet not owned up. "Krim" is the German for the Crimea, where they’d be speaking Russian, Ukranian, or Crimean-Tartar, none of which belong to my repertoire, but "Krimsekt" (i.e. Crimean sparkly, is much drunk in the German-speaking world, and I’ve always been partial to a glass of bubbly, so we’ll let it pass. I no longer have need of hair cream. Yes, what memories of waiting for the NEW Green buses coming along Howdon Road to pick us up at the end of Bridge Road South to take us to the Pedestrian Tunnel to walk through to Jarrow and Hebburn. Sadly the tunnel is now a shadow of it’s former self, tiles missing and escalators all dirty but those great days are now gone !!! Re the comment from Stew Smith (15/05/11 – 06:45) above – Rudy Schiber was the barber. 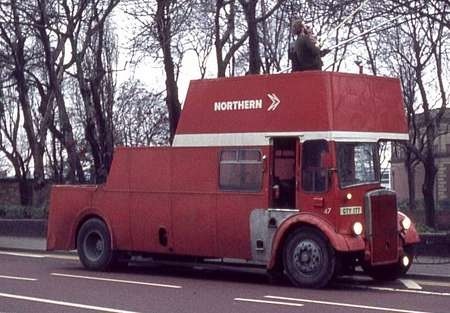 Northern General ran the 1st RED Atlanteans from their depot in South Shields and because of the overhang they continually demolished roundabouts until the drivers got the hang of them & stopped turning to early. Also the 1st ones were prone to losing their gearbox fluid all over the road. Incidentally is there a thread on South Shields Corporation Bus’s? which included both diesel and trolley. Not yet Jon but if you have a photo and some copy you could start one. My understanding is that some of the apparent eccentricities of the Tyneside company derived from it not being quite fully owned by Northern until the 1960s. 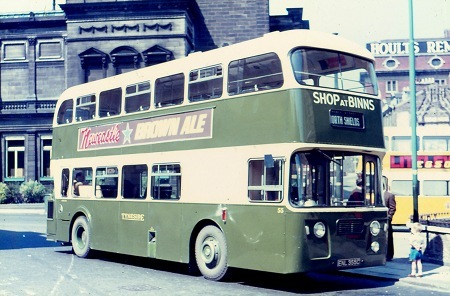 Northern had an interest in the Tyneside Tramways and Tramroads Co from 1913, and a controlling interest from 1936, but it only became a limited company when Northern gained full control and could now change the name to Tyneside Omnibus in the early 1960s. This happened after the construction of the new depot in Hadrian Road, and I can remember the odd sounding local newspaper reports "New depot for Tyneside Tramways" – which hadn’t run a tram since 1930! I think had Northern had full control earlier Tyneside would have been amalgamated with the wholly-controlled Tynemouth company. John – the German barber was Rudi Sieber. He was a friend of my dad’s (no idea how they met but I know they used to go out shooting together at one time) and I remember being taken to the shop as a small boy to get my hair cut. I was told that he had served in the Luftwaffe during the Second World War and he reckoned to have been in Russia – which may or may not have been true, as he was a ‘larger than life’ character! Willington Quay was well served by the green buses. The first I remember (about 1949) were Petrol Engined, with registrations JR8618 to JR8626. Bus numbers 18 to 26. From the timetable Tyneside needed 8 buses on the road. I think they always had 9, with one off the road for maintenance. This fleet of JRs was replaced by Leyland Diesels about 1950. BTY 167 to BTY 170 and CTY 331 to CTY 333; bus numbers 27 to 33. (Some years later 31 to 33 were operated by "Tynemouth" and all painted in Tynemouth Red, operating the Number 9 Route from the Tyne Tunnel to Culercoats). Next for Tyneside there were 4 buses with posh interiors again Leyland diesels with numbers from 34 to 38, but can’t remember the registrations. (Maybe ENL). After that Tyneside had a complete new set of Leylands; 39 to 47; again the registrations escape me. This was around the mid-fifties. One of this fleet embedded itself in Sammy Hendersons Sweet Shop in Borough Road Willington Quay one Sunday night. My mum got me out of bed to go and see it. I don’t think anyone was hurt, but the bus (42) was off the road for about 6 months. I then left Willington Quay and lost touch with their fleet. I think the next two buses they had were Leyland Backloading 30 footers; 49 and 50. Patrick Ray – Rudi Sieber was my Sister’s Father, her name is Helga. I know very little about him, my Mother Grace Victoria Baker was married to him before she married my Father John Frizzell. She worked on the Northern Buses for years. If you wouldn’t mind any insight into what he was like would be wonderful.